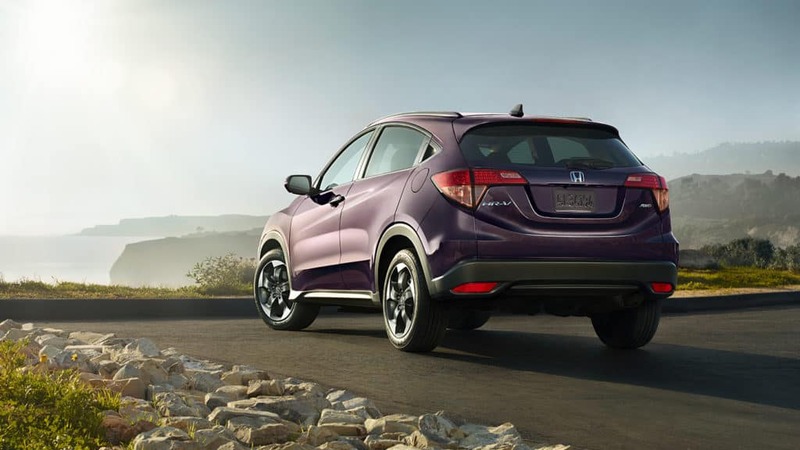 The Honda HR-V is a subcompact SUV car that provides plenty of space for people and cargo alike. The vehicle is well-built, but sizeable and practical at the same time. It sports a handsome styling from outside and comes in a new paint color of Aegean Blue Metallic. Further, the 2018 edition of the car features updated aluminum wheels with black inserts in select models. These darker wheel designs give off a sportier appearance to the vehicle. The car is available with both manual transmission and variable automatic transmission. However, the all-wheel-drive versions of the car are only compatible with the latter. Its models include EX, EX-L Navi, and LX. The small size of the 2018 Honda HR-V defines its versatility. The car’s most revered feature is its Magic Seat, under which the second-row seats can be slid and folded to make more room. Further, the rear-seat bottoms can be lifted up to create a cargo area that can hold items such as a bicycle. The rear seat can also swing up and out of the way creating an excellent space for even tall passengers. The empty space from the floor to the ceiling can be used by children while on a road trip. Overall, the Magic Seat feature can be configured in four different ways. Bluetooth that easily connects Apple or Android phones. The mini crossover car features a 7-inch touchscreen infotainment system, automatic climate control, a sunroof that can be tilted or slid, keyless entry, and push-button start. Other modern conveniences of the car include heated seats, rearview camera guidelines, leather upholstery, a four-speaker sound system, rear privacy glass, a passenger-side blind spot camera, and navigation and satellite radio. Standard features include an auxiliary input, Bluetooth, USB port, and voice command. The HondaLink touchscreen infotainment system in 2017 model of the HR-V is easy to use owing to its capacitive touchscreen. Response time is almost similar to other SUVs with similar infotainment systems. All the central controls are easily operational and reachable from the driver, but their specifications vary from model to model. activated with the simple push of a button, so you don’t fumble around while trying to park your car. There are two standard airbags, and child seat LATCH points. The Honda HR-V is extremely fuel efficient. Its diminutive engine can be effortlessly paired up with the six-speed manual transmission, which is only available with a front-wheel drive. It is powered by a 1.8-liter four-cylinder engine that gives a horsepower of 141 and a torque of 127 pound-feet. Stop by Millennium Honda for a great deal on the new 2018 Honda HR-V. Our team is ready to show you all of the features that you will find in the Honda HR-V and take you for a test drive in the Hempstead area. At our NY Honda dealership you will find competitive prices, a stocked inventory of 2018 Honda HR-V subcompact SUV and a helpful sales team. Stop by our Honda dealership today and take a 2018 Honda for a spin. *25 city/33 highway/28 combined mpg rating for 2WD 6-speed manual transmission models. 28 city/34 highway/31 combined mpg rating for 2WD CVT models. 27 city/31 highway/29 combined mpg rating for AWD CVT models. Based on 2018 EPA mileage ratings. Use for comparison purposes only. Your mileage will vary depending on how you drive and maintain your vehicle, driving conditions and other factors.